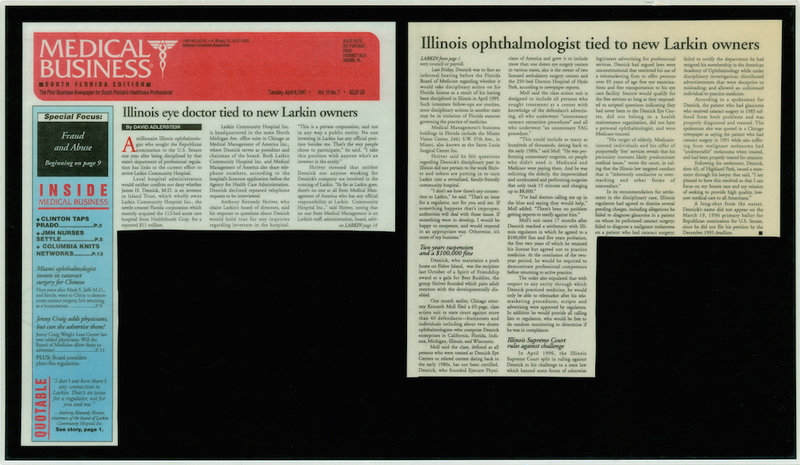 A millionaire Illinois ophthalmologist who sought the Republican nomination to the U.S. Senate one year after being disciplined by that state's department of professional regulation has links to the current effort to revive Larkin Community Hospital. Local hospital administrators would neither confirm nor deny whether James H. Desnick, M.D. is an investor in Island Trust, which wholly owns Larkin Community Hospital Inc., the newly-created Florida corporation which recently acquired the 112-bed acute care hospital from HealthSouth Corp. for a reported $11 million. Larkin Community Hospital Inc. is headquartered in the same North Michigan Ave. office suite in Chicago as Medical Management of America Inc., where Desnick serves as president and chairman of the board. Both Larkin Community Hospital Inc. and Medical Management of America also share telephone numbers, according to the hospital's licensure application before the Agency for Health Care Administration. Desnick declined repeated telephone requests to be interviewed. Anthony Kennedy Shriver, who chairs Larkin's board of directors, said his response to questions about Desnick would hold true for any inquiries regarding investors in the hospital. "This is a private corporation, and not in any way a public entity. No one investing in Larkin has any official position besides me. That's the way people chose to participate," he said. "I take this position with anyone who's an investor in the entity." Shriver stressed that neither Desnick nor anyone working for Desnick's company are involved in the running of Larkin. "As far as Larkin goes, there's no one at all from Medical Management of America who has any official responsibility at Larkin Community Hospital Inc.," said Shriver, noting that no one from Medical Management is on Larkin's staff, administration board, advisory council or payroll. Last Friday, Desnick was to face an informal hearing before the Florida Board of Medicine regarding whether it would take disciplinary action on his Florida license as a result of his having been disciplined in Illinois in April 1995. Such interstate follow-ups are routine, since disciplinary actions in another state may be in violation of Florida statutes governing the practice of medicine. Medical Management's business holdings in Florida include the Miami Vision Center, 2441 S.W. 37th Ave., in Miami, also known as the Santa Lucia Surgical Center Inc.
Shriver said he felt questions regarding Desnick's disciplinary past in Illinois did not pertain to the work Shriver and others are putting into turn Larkin into a revitalized, family-friendly community hospital. "I don't see how there's any connection to Larkin," he said. "That's an issue for a regulator, not for you and me. If something happens that's improper, authorities will deal with those issues. If something were to develop, I would be happy to cooperate, and would respond in an appropriate way. Otherwise, it's none of my business." Two years suspension and a $100,000 fine Desnick, who maintains a posh home on Fisher Island, was the recipient last October of a Spirit of Friendship award at a gala for Best Buddies, the group Shriver founded which pairs adult mentors with the developmentally disabled. One month earlier, Chicago attorney Kenneth Moll filed a 65-page, class action suit in state court against more than 40 defendants - businesses and individuals including about two dozen ophthalmologists - who comprise Desnick enterprises in California, Florida, Indiana, Michigan, Illinois, and Wisconsin. Moll said the class, defined as all persons who were treated at Desnick Eye Centers or related centers dating back to the early 1980's, has not been certified. Desnick, who founded Eye Care Physicians of America and grew it to include more than one dozen eye surgery centers in various states, also is the owner of two licensed ambulatory surgery centers and the 250-bed Doctors Hospital of Hyde Park, according to newspaper reports. Moll said the class action suit is designed to include all persons who sought treatment at a center with knowledge of the defendant's advertising, all who underwent "unnecessary cataract extraction procedures" and all who underwent "an unnecessary YAG procedure." "This could include as many as hundreds of thousands, dating back to the early 1980's," said Moll." "He was performing unnecessary surgeries, on people who didn't need it. Medicaid and Medicare were paying them. And he was soliciting the elderly, the impoverished and uneducated and performing surgeries that only took 15 minutes and charging up to $8,000." "I've had doctors calling me up in the blue and saying they would help," Moll added. "There's been no problem getting experts to testify against him." Moll's suit came 17 months after Desnick reached a settlement with Illinois regulators in which he agreed to a $100,000 fine and five years probation, the first two years of which he retained his license but agreed not to practice medicine. At the conclusion of the two-year period, he would be required to demonstrate professional competence before returning to active practice. The order also stipulated that with respect to any entity through which Desnick practiced medicine, he would only be able to telemarket after his telemarketing procedures, scripts and advertising were approved by regulators. In addition he would provide all calling lists to regulators, who would be free to do random monitoring to determine if he was in compliance. Illinois Supreme Court rules against challenge In April 1996, the Illinois Supreme Court split in ruling against Desnick in his challenge to a state law which banned some forms of otherwise legitimate advertising for professional services. Desnick had argued laws were unconstitutional that restricted his use of a telemarketing firm to offer persons over 65 years of age free eye examinations and free transportation to his eye care facility. Seniors would qualify for the free services so long as they responded to scripted questions indicating they had never been to the Desnick Eye Center, did not belong to a health maintenance organization, did not have a personal ophthalmologist, and were Medicare-insured. "His target of elderly, Medicare-insured individuals and his offer of purportedly 'free' services reveals that his pecuniary interests likely predominate medical issues," wrote the court, in ruling that the Illinois law targeted conduct that is "inherently conducive to over-reaching and other forms of misconduct." In its recommendation for settlement in the disciplinary case, Illinois regulators had agreed to dismiss several pending charges, including allegations he failed to diagnose glaucoma in a patient on whom he performed cataract surgery; failed to diagnose a malignant melanoma on a patient who had cataract surgery; failed to notify the department he had resigned his membership in the American Academy of Ophthalmology while under disciplinary investigation; distributed advertisements that were deceptive or misleading; and allowed an unlicenced individual to practice medicine. According to a spokesman for Desnick, the patient who had glaucoma who received cataract surgery in 1983 suffered from both problems and was properly diagnosed and treated. The spokesman also was quoted in a Chicago newspaper as saying the patient who had cataract surgery in 1991 while also suffering from malignant melanoma had "undetectable" melanoma when treated, and had been properly treated for cataracts. Following the settlement, Desnick, then 43, of Highland Park, issued a statement through his lawyer that said, "I am pleased to have this resolved so that I can focus on my Senate race and my mission of seeking to provide high quality, low-cost medical care to all Americans." A long-shot from the outset, Desnick's name did not appear on the March 19, 1996 primary ballot for Republican nomination for U.S. Senate, since he did not file his petition by the December 1995 deadline.